Rainstorm “Rain” Christiansen is an agent with the FBI’s Behavioral Analysis Unit. He’s a profiler, and a damn good one. With one tiiiiiny little problem: he can see ghosts. He can talk to ghosts. And they talk to him. Rain has been able to see them his entire life, but has never dared to tell anyone. Who would believe him? Well, okay, his free-spirited hippie parents certainly would, but his fellow agents? His superiors? Nope. Not a chance. They would put him on psychological leave until he got his head screwed on straight. So when he is caught trying to deliver a message from beyond the grave, his boss gives him one last chance and sends him down to backwater Florida to work a five year-old cold case … except this particular backwater is his old hometown, and his ex-boyfriend Danny McKenna is part of the police unit he will be assisting. Oh, and did I mention the ghost problem? This is the first novel that I have read by Harmon, and it will definitely not be the last. Not only is the mystery compelling — was Amy Greene murdered? if so, by whom and why? — but the characters are wonderfully complex. The entire story is told from Rain’s first person point of view, which can be hard to pull off; but he is such a wry narrator, with a skewed but affectionate way of seeing people and situations, that I just had to keep reading. He obviously adores his family, but they also drive him crazy (his artistic mother is studying Wicca, his father grows pot in the back greenhouse, and his vegan sister can’t cook to save her life). He loves Danny, but is terrified of what will happen if he confesses that he can see spirits. And the ghosts … well, he has absolutely no idea what to do about the ghosts. But embracing his gift may be the only way to find out what happened to Amy Greene. While Rain’s mother is studying Wicca, and his sister practices a sort of eclectic Earth-focused spirituality, Rain himself is spiritually undefined; possibly borderline agnostic. That may well be due to the fact that he can see ghosts, but they have no idea what lies beyond, and most of them refuse to admit there is any sort of “light at the end of the tunnel.” They’re stuck here until … he does something. But Rain has no training, has no idea what he should be doing. From a Pagan point of view, this is an interesting dilemma. As one of the ghosts points out, Rain is not the only medium, but most people with the gift go crazy or commit suicide — because, I would suggest, the traditions which believed in and would have trained mediums have been largely wiped out. Which leaves Rain to figure things out on his own. P.S. 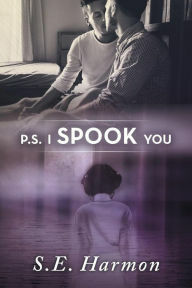 I Spook You is exciting, romantic, and just a little bit scary, with a sly and witty narrator. Highly recommended to fans of CS Poe, Layla Reyne, JL Bryan’s Ellie Jordan series, and Delilah Devlin’s Caitlyn O’Connell series.